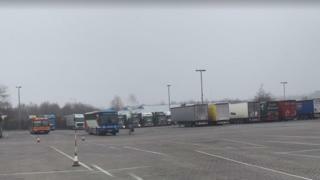 Nine men and two women have been handed over to immigration officials after they were found at a lorry park. They were detained in Waterbrook Avenue, Ashford, on Saturday morning, Kent Police said. A Home Office spokesman said the group presented themselves as Eritrean, and their cases would be progressed in line with UK immigration rules. Meanwhile, French police have arrested more than 60 migrants who climbed aboard a ferry docked at Calais. A Pas-de-Calais prefecture official told Reuters news the migrants entered the port area on Saturday night and used ladders to climb onto a ferry that had arrived from Dover.